Today was the deadline for the post production shoot in which we had to edit the images fromTHIS shoot and turn them into an editorial story for a fashion magazine. I was up until stupid o’clock in the morning getting the final bits of my sketchbook done. Finally it has been finished, handed in, and swept under the carpet. Here’s what my final piece looks like. Sorry about the poor quality images. Just took them with a point and click camera in a rush this morning! I chose to call my story ‘Shoulders To Fly On’ as it is based on the work I did on the shoulders of the t-shirt, and the fact that they give the appearance of wings. 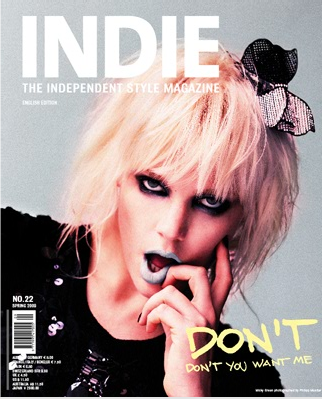 We also had to choose which magazine we would see it featured in, so I chose Indie magazine as I love its simple photo shoots and clean lines within its editorial stories. I’m really pleased with how it went, and tonight I can rest easy until I have to start some new work on the next brief. That can wait until tomorrow though. For now, that is all, as I am a very sleepy girl and need my bed. I love it! The 'wing' detail is lovely and it really looks like an editorial from Indie! i love it! Great job. It looks ready for an editorial.